This seems like "Captain Obvious" advice, but I'm *amazed* at how often people don't heed it. Particularly the first part is for some reason not intuitive. Teachers often assign slow-moving music to young singers because the very pace of the music keeps the student from being overwhelmed by fast-moving notes, rapid text, etc. BUT, slow music often lacks moto-rhythm and requires a young singer to provide all of the energy to make the piece flow. In other words, slow music is easy to SING, but hard to SING WELL. Often the accompaniments of those songs lack subdivision, syncopation and other energy-giving features. Many young singers aren't up to that task of providing all of the energy by themselves. 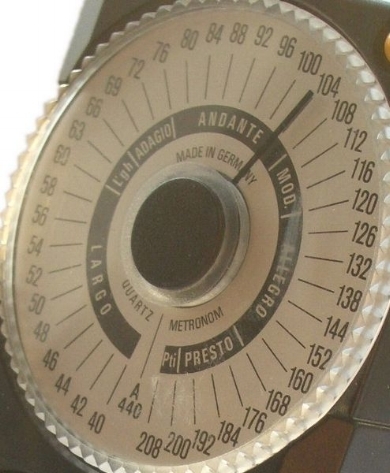 SO, identify the eventual target tempo, and then move the metronome up significantly. For the sake of example, let's say the piece is eventually going to be Q=60. Why not start Q=100, which would feel downright fast! Then work your way down gradually: Q=92... Q=84... Q=76, etc. Never lose the vitality, the subdivision, the inner dance of the music as the metronome gets gradually slower. "Boil the frog," so to speak, and you'll sound and feel much better singing slow music. As for fast music, such as difficult coloratura, I recommend identifying the goal tempo, and then cutting it in half. As an example: suppose the eventual tempo is Q=120. Start at half of that, Q=60, then work your way up one metronome notch at a time, earning your stripes and accruing fluidity, accuracy, and ease along the way. With this kind of practice, you can sing even the thorniest coloratura with command, elegance, and ease. I hesitate to even write all of this, as it seems so obvious. But, one of the things I've noticed generally among singers is that we know what we SHOULD do to prepare a piece, and we just don't ROUTINELY do it. It is this routine that I'll be discussing in my next few posts, as I tackle the HOW of practicing. I hope this all helps--happy practicing!